As arguments rage over the latest problems to be exhibited by the New Bus For London (NB4L), which is definitely not a Routemaster, the idea has been pitched by Labour Mayoral hopeful Christian Wolmar that these vehicles might best be taken out of service - and, by implication, deliveries stopped - to save TfL any further embarrassment. There is a significant precedent for this action, from half a century ago. The NB4L was not first offered by a bus manufacturer to TfL; rather, the Heatherwick concept was taken to the manufacturers to see if they would like to build it, and this parallels what happened in the late 50s. West Riding, the largest independent operator in the UK, operated in an area where the roads were in a generally awful condition. Fleet engineer Ronald Brooke had his own ideas of how to tackle this. He decided that the solution was a vehicle with air suspension and disc brakes - at the time unheard of in the UK bus industry. Armed with his specification, he presented builders with it. With one exception, they passed on the idea. It was just too radical. But Guy Motors of Wolverhampton saw this as their opportunity to mix it with the biggest players, and so was born the Guy Wulfrunian. 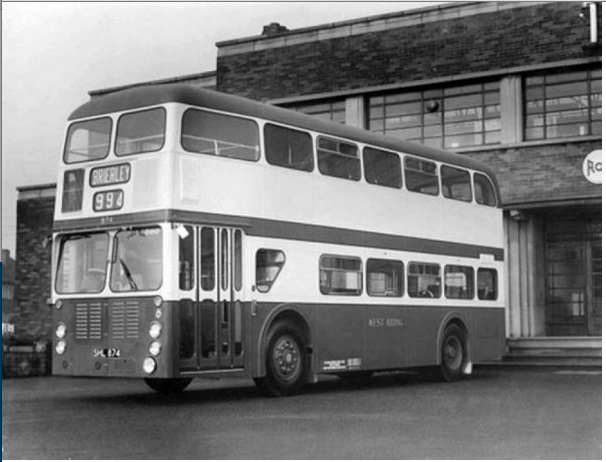 The Wulfrunian had a lot in common with the NB4L: it was heavy for a late 50s double decker, some vehicles had their passenger capacity reduced, although this was for maintenance reasons, rather than legal ones, hardly anyone except the launch customer went near the design, the number of novel features led to unforeseen problems, and the cooling system had a reputation for alternately baking and freezing passengers. The design looked attractive at the outset: for instance, the drop-centre rear axle meant it was a genuinely lowbridge design, and so could operate on a wider range of routes. But placing the engine at the front, when Leyland and Daimler were already working on rear engine designs, was not a good idea. Drivers complained of the roasting heat, made worse by the Gardner power unit having a right-hand exhaust. 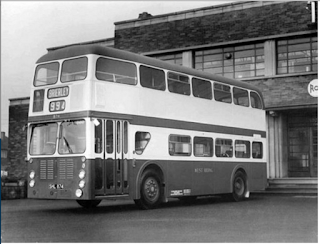 Eventually, even the enthusiasm of West Riding waned, and they cancelled a final order for 25 buses, which ended production of the Wulfrunian after the mid-60s. By 1972 - the newest vehicles managed less than seven years in service, less than half what might have been expected - they had all gone. West Riding, by now in dire financial straits, replaced the Wulfrunians with rather older second-hand Bristol Lodekkas. The NB4L is already operating for most of the time without rear platform attendants, and so the “hop on, hop off” feature is effectively redundant, a waste of time. If battery reliability persists, that will harm the design’s green credentials. Electrical problems are harming reliability. The air cooling problem has still not been solved. TfL need to ask themselves: can they swallow their pride, bite the bullet, and admit defeat? Having a bus designed on the personal whim of a key player was not a good move by Ronald Brooke, West Riding, and Guy Motors. It’s still not a good idea, even if Bozza says it is. The Boris Wulfrunian may have been an interesting concept, but no more. Some of your reporting about Guy is rather wide of the mark. Let me set you straight. Guy were, at the time of the Wulfranian launch, a significant player in the industry: their conventional Arab chassis had a reputation for reliability and had sold well for the better part of two decades. Something like 150 companies ran Guy buses in the 1950s, and they were sold in over twenty countries worldwide. However, Guy had seen the way that new buses were going. They had done nothing because Sidney Guy, the company's founder, had worked on the principle of don't fix what ain't broke. Only when he retired in 1957 could new designs be contemplated, by which time Leyland and Daimler were several years ahead of the game. The Wulfranian was radical and it did use a lot of unproven technology. But fundamentally the design was workable - fifteen years later Volvo built a front-engined, front-entrance double decker which was offered with air suspension. It sold well, and Volvo got a sizeable share of the bus market on the back of it. What killed the Wulfranian was not actually its flaws: the real killer was that Guy Motors had made the disastrous decision to take its bus sales in South Africa in-house rather than using a distributor - which bled the company dry, and there was no money to address the Wulfranian's failings. This is where the stories of the Wulfranian and the NB4L part company. Given that transport in London is handsomely subsidised by those in the provinces who will never get any benefit from it, the builders have as long as they like to fix NB4L's manifest deficiencies - because Cameron and his city boy friends will ensure you and I pay for it. The problem is that you have to deal with problems at the time, not several years later. Quite apart from the front weight bias the Wulfrunian had - hence the extreme-looking measure of removing the front eight seats on the top deck - there was the size of the Gardner 6LX power unit, and its heat and noise. Also, customer service has to be addressed at the time - some of the operators who took a single Wulfrunian chassis ended up not taking more, companies like Lancashire United selling their example on to West Riding. The fact remains that the idea was too much at the time. That could be the same with the NB4L. And where may these first generation Boris monstrosities end up? The "West Riding" if First get their way and have them on the streets of Leeds. "The NB4L was not first offered by a bus manufacturer to TfL; rather, the Heatherwick concept was taken to the manufacturers to see if they would like to build it, and this parallels what happened in the late 50s." This is incorrect, speaking as the person who started this whole farrago. NB4L proposals were offered to TfL by 2 manufacturers in Dec '09 as part of the confidential manufacturing competition. TfL chose the Wrightbus version, rather than ADL's. The ADL offers included one by Capoco & one by Fosters+Aston-Martin; these being the two winners of the public design competition. Remarkably soon after, around Jan '10, it was TfL themselves, who took Heatherwick Studios (plus their public purse funding) to Wrightbus to support them in their design & manufacturing contract that they had just been awarded. That green Boris Boggler on the streets of Leeds was a piece of grotesque PR hype. Sorry: "six months' evaluation". The damn thing was even branded N[ew] G[reen] T[ransport] to try to prove a rival to the Leeds trolley-bus. Not "new". Not "green". Not clever.